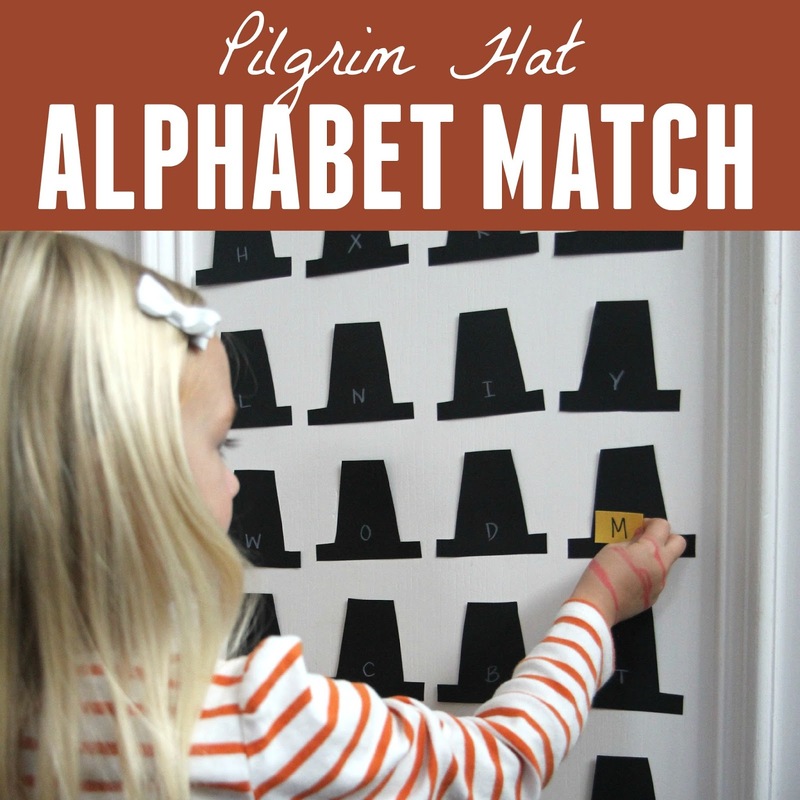 Alphabet matching games are some of our favorite things to create... especially using a holiday theme! Last week we made a simple pilgrim hat alphabet matching game using the same hats that we created for our pilgrim photo puppets. 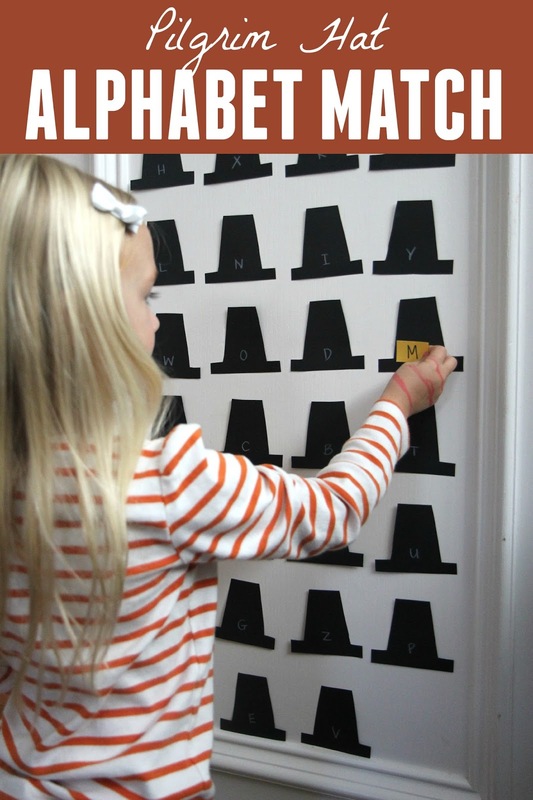 This activity was an easy way to practice letter recognition and matching! To get started you need to prep you materials!! Make 26 little hats using black cardstock and 26 little yellow rectangles for the buckles on the hats. Next you'll want to write the alphabet letters on the black hats with white crayon and then write the alphabet letters with black marker on the yellow buckles. Once the alphabet buckles and hats are ready, stick the hats onto the wall or a table using painter's tape and encourage your child to start matching the buckles with the matching hats! I stick blue painter's tape on the back of each yellow buckle so that my kids could easily stick the buckles on the hats. If you want this activity to survive longer than a few days... laminate the pieces! While we matched the letters we talked about different words that started with the letters we were looking at and we also talked about other places we've seen the different letters. I loved watching my three year old work together with my almost five year old on this activity! For my three year old this activity was more about matching and visual discrimination with the letters while my daughter was making meaning of the letters and working on saying their letter names and sounds. Once we matched the buckles with the hats then we removed the buckles and played again! I love setting up little activity stations like this at my house so that the kids can just go and play with them whenever they want. Do your kids like alphabet matching games? Year old sister and a teachers aid at preschool in the same week. Is this a phase or is something wrong? Any advise from someone that's been in my situation. Thanks!